One of the great things about being an entrepreneur is feeling a sense of intense pride in your work. However, an even greater feeling is being able to pass down that pride and some entrepreneurial skill to your children. 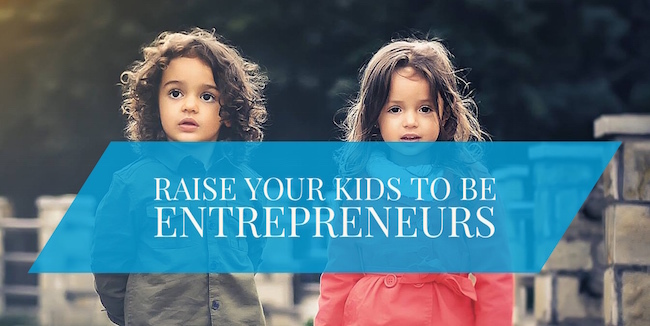 There are many ways to raise your children to be entrepreneurs, and the truth is, they will learn a lot simply by watching you work. However, below are the four main ways to actively impart your entrepreneurial skill set onto your little ones. We all know that being an entrepreneur is a lot of hard work. Nothing about running a business comes easily, and if you want your children to be successful business owners, they have to learn that they need to work hard to make it happen. You can teach your children the value of hard work through reward systems, payment systems, or by simply praising them. Show them what it means to work hard, and when you do nice things as a family, make sure they know you’re able to do those things because of hard work. Kids have the wackiest and craziest ideas. Don’t squash them! There are many examples of young children running successful businesses or learning business skills at a young age. Adults always seem to lose the excitement, fun, and imagination that kids have, so while your kids are young, harness it. Help them see that every idea they have is an opportunity to turn it into something greater. Many of the most successful entrepreneurs in existence have tried and failed numerous times in business. Let your kids start early so they can get to their successes sooner. If you think about it, every single moment of your day is a learning and a teaching opportunity. When you go to the grocery store, bring cash and ask your child to count out the cash and collect the change. When you fold laundry, explain to them that someone had to invent the washing machine and then form a business to sell those washing machines to consumers. Everything in your home, from your mattress to the food in your refrigerator came from a business. If your children start to understand the world as a series of businesses then they can brainstorm and then about a way to contribute or add to that themselves. Picking yourself back up after you fall is a lesson every entrepreneur has to know and deal with daily. Make sure your kids know that mistakes are okay, whether they lose a big game or their lemonade stand fails on a Sunday morning. As long as your kids know that one setback doesn’t mean they should quit entirely, they’ll be well on their way to being ready to be entrepreneurs. Ultimately, although being a small business owner is challenging, I can’t wait to hear some of the ideas my kids have for future businesses someday. I want them to know they can be the boss and make the world a better place through their work ethic, ideas, and good business sense that they’ll acquire as they grow.